Flame Toys have announced their second Transformers project. Following on from their non-transforming action figure version of Drift, Flame Toys will be tackling the big bad Tarn himself. Tarn is the leader of the Decepticon Justice Division featured in the IDW More than Meets the Eye series. The lineart shows a heavily bulked out robot form – though there may be some irony in the robot addicted to transforming receiving a non-transforming release. Thanks go to 断翼华尔兹 for the image. 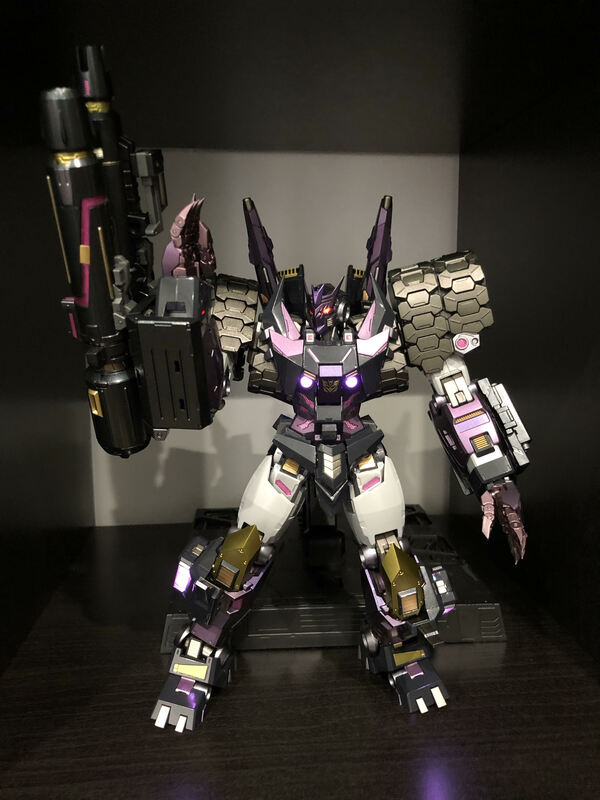 Would love a Siege Voyager class Tarn even more. A try out for a similar set up. But with another head. Now I need to figure out how to make a Cybertronian spine. The human figure at his left foot is for scale. It's in 1/43rd and looks pretty good scalewise. I've found an image online with the actual size of the DJD, and it suggests Tarn is about 12 meters tall. So the figure is somewhere between 1/50th and 1/43rd scale. I'm looking at some extra accessoiries for him. Got a few weapons and stuff, as well as some fun things. Here he is with the Lance of Longinus from Evangelion. It's an app. 30 cm long spear from Shapeways. More pictures coming. Just need to have a better set up / background for him first. Yeah, not satisfied. Will have to try again using the stand after all. And last but not least, an attempt at a famous pose. A few poses. He can hold the combined gun, but as a bazooka. Looks good though. I also gave him a big sword. Picked up mine today. Was a little hesitant at first (no transforming and high price), but got a little extra cash, so I treated myself to this figure. Nice and heavy, great poseability. Very bulky as well, compared to this figure, MMC's Kultur looks very skinny. Only cons I can think of is the fingers popping out and inability to hold the combined gun stable. If anyone has some good suggestion how to have him hold it, I'd love to hear. I do regret not being able to get the version with the bonus parts (speakers and clean mask). I don't care for the mask, but those speakers look awesome. And finally a figure that can hold the "This is SPARTA!" pose without falling over or needing support. Such a gorgeous figure, and awesome mechanics. Some cons: mainly the wrist. I’m really worry that clamp with snap one day. Drift is overall a more flawless figure, but hey, this Tarn is still great. Full gallery coming soon. I would agree that Drift is the better (engineered) figure but I prefer Tarns sculpt and color scheme. Can‘t wait to get Star Saber. Looking forward to this line continuing. Thanks for the info, was thinking about buying both Drift and Tarn, because I am interested in Star Saber. For $400+ pieces, there should be no QC issues. What I would be interested in is the state of the figure after some play. Some people have reported that the figure becomes floppy afterwards. No one has come out denying that which is really worrying. Still need to check the screw holes, and maybe he’ll loosen up to my dislike after a couple months, but so far, yeah. Awesome. What are the holes on the sides of his waist for? Here's to hoping someone will make ratchet joint replacement for Tarn.